Reading Pedigrees is very important. It represents the history of your German Shepherd puppy. Reading pedigrees is very important. Tracing the lineage of a purebred dog is easy, and you should already have the main tool in your possession - the pedigree. If you are a novice dog buyer/owner even after reading the pedigree it may still mean little to you. Simply knowing that the German Shepherd “has papers" is enough for many people, but understanding what is on “the papers” oftentimes may be a mystery not yet solved. Depending on the source, or purchase point, the information on the German Shepherd may be excellent, good or fair - or even worse. Not to alarm anyone, but it is always best to buy your German Shepherd puppy from a reputable breeder AFTER doing research and consulting your veterinarian and other health professionals first. You are considering adding a companion and friend to your family for the next 8 - 13 years - this is definitely not a purchase that you want to make on impulse. Owning a dog, any dog, can be an exciting, rewarding and, oftentimes, challenging experience. Whether you own a purebred or mixed-breed, understanding your dog is a very important aspect of your relationship. Having some kind of idea of what types of dogs your mixed-breed is “kin to” will definitely give you some ideas of how and what to expect from the animal in many ways - its physicality, temperament wise, etc. Tracing the lineage of a purebred dog is even easier, and you should already have the main tool in your possession - the pedigree. Knowing the history of your German Shepherd gives us an excellent idea of what we might expect from the dog - having a knowledge of the immediate ancestry is even better. 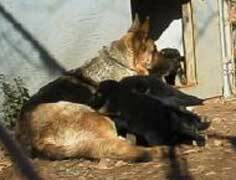 Being able to see the German Shepherd puppies entire litter, their parents and possibly other related dogs is an important step in choosing a puppy. Puppies brought home from a pet store may have a "shady" background at best - and how will you not know whether or not a particular health problems runs in that litter or family of dogs? How it's litter mates and parents behave(d)? What can you expect from it temperament wise? You have no history to compare it to. 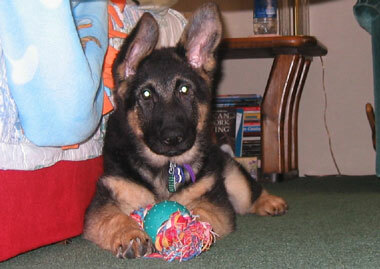 Regardless, you now have the German Shepherd puppy and the pedigree in your possession. How do you go about deciphering that piece of paper? What do all those abbreviations mean, and who are all those other names listed on the page? Reading pedigrees does not have to be so hard. Overall, many items should be self explanatory, still let’s take a moment to look at the various things that make up the pedigree. Many of the more common abbreviations will be described at the bottom of this web page. First, the dog’s complete registered name and registration number should be evident. Depending on the dog and the breed you may see OFA followed by a number. This simply means x-rays of that particular dogs hips (and sometimes elbows as well) have been examined and evaluated by the staff at the Orthopedic Foundation for Animals (OFA). An OFA number simply means that that particular German Shepherd has been certified having its joints passed by the team of evaluators at the OFA. An OFA number is very good - especially for a German Shepherd owner - and the more on the pedigree, the better. On a German GSD pedigree you might see an "a" stamp in which the dogs hips have been approved for breeding. The European countries have much stricter rules concerning breeding practices than those found in the U.S.
Now, as you take the time to look through the names, reading pedigrees take time to investigate more than just the surface information - dig a bit deeper into the abbreviations, the numbers, kennel names, etc. Exactly what do you see? If you were lucky enough to purchase your German Shepherd puppies from a breeder who truly loves the dogs, you may additionally be able to get copies of photographs of some of the ancestors of your puppy as well as get to hear about some of the traits of several of these dogs. Below, for your convenience, we will list several common abbreviations you may see when reading pedigrees - your German Shepherd's pedigree or another, and what they mean. Keep in mind that reading pedigrees requires more than just knowing you have “papers”- it is the first step in understanding your dog’s background and lineage as well as what you may expect of your animal in the future. 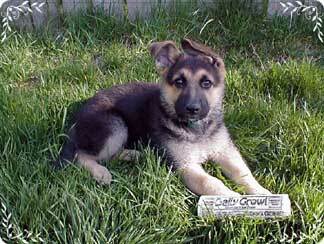 This paper and the information on it is very important and represents the history of your German Shepherd puppy. Even more important, however, is the love, time and effort you put into your new German Shepherd puppy to form it’s future and the future of the breed.